Want to go for Java style applications that are comparatively lightweight, scalable and user friendly, Kotlin is the way to build such high quality, responsive and highly performant applications. 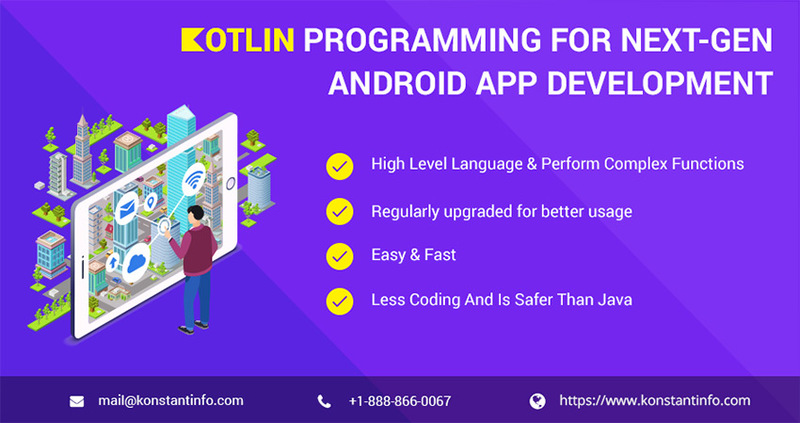 Over time, Java has been used for Android app development services but now with the technological advancement a new programming language Kotlin is said to be replacing Java which has put a question on its persistence in the coming years. This newly developed language is comparatively easier and more efficient than Java leading to a sudden surge in demand. Companies are now looking forward to hire Android developers who have the knowledge of this language and can upgrade themselves with the changes that would be introduced in it. Right before the 1.0 version of Kotlin was released the language has gone through Alpha and Beta versions and has been used in real-life projects. The environment of the language is such that anyone can use it easily right from the beginners to the professionals. The IDE plugin also works smoothly with this language and you can use the similar features that can be used in Java. Kotlin is still at the nascent stage but the company behind its development i.e., JetBrains is upgrading it from time to time and bringing up new features and tools that would make this programming language even better. For Android, JetBrains has got the support of Google to enhance this language and make it one of the best in the world. Kotlin Android Extensions is one of the most popular upgraded features which have libraries like Anko which has optimized the regular library sizes. Till now, Java was used for app development but with the involvement of Kotlin this process has become simpler and powerful. The library needed to write the Kotlin apps is very small which makes it an ideal language to use for app development. Moreover, the compilation time of the app is similar to that of Java or even faster. Kotlin takes just 10 minutes or less to set up the project and would not bug you much as the procedure is extremely simple. Even if you are just in the initial stages of programming, you would be able to use it efficiently without much hassle. Once you have integrated Kotlin with Android, you can work easily in it just like you were working with Java and use the instant run programs from the IDE without any issues easily. Related post: Kotlin vs Java: Which will Succeed Android Development in Coming Times? As a Java developer, you must be well aware of the technical difficulties that you might have to face at times when the NullPointerException takes a lot of effort and time to resolve the issue. Even with the efficient tools and features present in Java, this issue just does not go away. With Kotlin, the problem becomes much easier as it involves less coding which eventually discards any chances of technical errors that you might have to face otherwise. As this reduces the time spent on fixing the issues, more work can be completed within less amount of time. This is one of the best features of Kotlin as you can code on any platform according to your convenience. With Kotlin JS, you can even enable front-development which makes it a multi-purpose language on the whole.